The Model 'F' was very similar in design to its earlier sister, the E with the only noticeable difference being the 'F' had a kick starter. Again the F model shared the E model's C shaped frame, with built in toolbox, petrol tank under the seat and a rear butty box. The F was introduced in March 1954 and had a production run that lasted until April 1955. It should be noted that of the 32,701 Model F's made, none were ever imported into Britain. 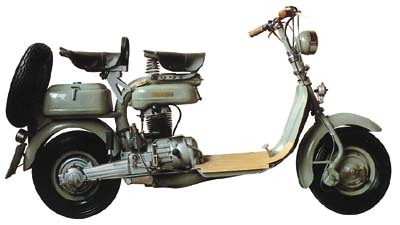 Torsion bar rear suspension, direct air cooled engine, were other shared features, with a side stand as standard, a centre stand was offered as an option. Money saving features such as pressed steel brake drums instead of cast aluminium, found their way onto the F model. Half way through the production run, the second version appeared, wearing similar forks to the D model. The Model F was available in a variety of paint schemes including grey, alabaster, china blue, brown, off white and maroon and was available in various guises throughout its life span.